On or after June 4, before the rush hour, city contractors will close 116th Street between Towne Road and Spring Mill Road to all but local traffic for approximately 65 days. This closure is necessary to complete two projects - the replacement of a bridge just east of Clay Center Road and a culvert over Williams Creek, just west of Ditch Road. The detour route uses 106th Street. The anticipated completion date of these projects is August 8, weather permitting. The map below indicates the closure and detour route. 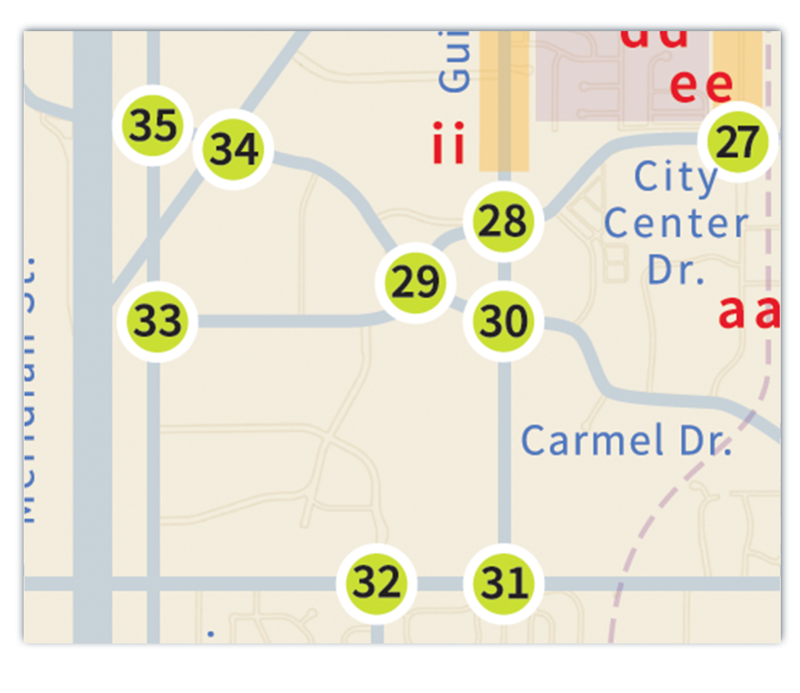 Carmel builds roundabouts because of their proven safety record; compatibility with the environment; aesthetics, and ability to make it easier for pedestrians and bicyclists. Roundabouts reduce injury accidents by about 80% and accidents overall by about 40%. The storm water and drainage projects included in Carmel Link 2.0 are designed to maintain existing storm water infrastructure, construct new infrastructure, address localized drainage issues, and reduce waterway pollution. Widening and reconstruction of streets creates less congestion, a more responsible impact on the environment, greater aesthetic appeal and increased safety. By adding more bicycle friendly multi-use paths, Carmel encourages citizens to walk, jog, and run. The projects listed below provide general information and will be updated as necessary. Please be advised that construction timelines and construction information are subject to change due to weather or other unforeseen circumstances. View the complete overview map and/or brochure guide of all infrastructure improvement program details, showing all Roundabouts, Storm Water/Drainage and Street/Pathway improvements. There are several ways to stay informed of the latest news and information. Sign-up to get email updates, or visit the Projects and Maps section to download PDFs of the infrastructure improvement program overview map and specific project detour maps. 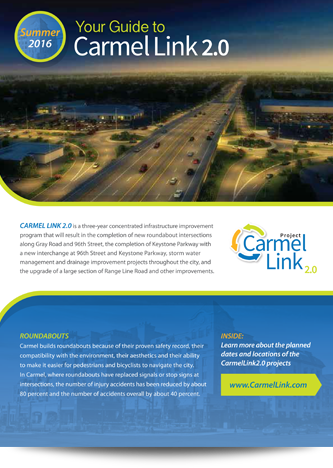 The Carmel Link 2.0 mobile app to access real-time traffic reports, delays, detour routes and more. A mobile app for your Apple and Android devices will be complete this fall. Stay tuned for more details. "Making it safer number one and then number two making it easier and quicker for people to get around."